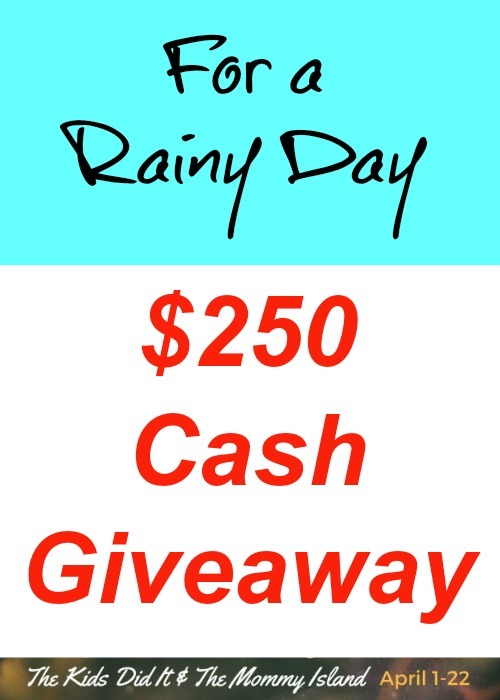 $250 Giveaway – for a rainy day! Beat the rainy day blues by entering to win during the $250 For A Rainy Day cash giveaway where you have the option of choosing between $250 PayPal Cash OR an Amazon E-Gift Card! This event was organized by The Kids Did It & The Mommy Island and sponsored by the awesome bloggers, authors, and Etsy shop owners listed below! ONE entrant will be selected by the entry form to win $250 PayPal cash OR $250 Amazon e-gift card. Open for entry WW, 18 years and older from 04/01/17 at 12:01 a.m. ET thru 04/22/17 at 11:59 p.m. ET. No purchase necessary. Void where prohibited. The winner will have 24 hours to respond to notification email to claim their prize or a new winner will be selected. See Rafflecopter for official rules. The Kids Did It & The Mommy Island are responsible for sending the winner their prize via PayPal or Amazon. The winner has the option of choosing between PayPal and an Amazon gift card. We already celebrated Easter, and I am doing a lot of backpacking to train for a long distance trip later in the year. My daughter turns 7 a week before Easter so we have a big party planned! It’s her golden birthday so it has to be special! Aaaw! That will be such a fun time! I never heard of the golden birthday? My daughter will be 7 in July. I’ll have to google it. 🙂 We’ll be going to Splash Kingdom for her birthday since it’s in the summertime it’s hard to get together with friends with everyone traveling so we do something big like go to a museum or now they are older to a waterpark. 🙂 Hope your daughters party is tons of fun! Bet it will be!!! A Golden Birthday is just when you turn the age of your birth date. My daughter turned 7 on April 7th so her Golden Birthday is when she turned 7. My Birthday is May 23rd so mine was when I turned 23. We make the Golden Birthday pretty special! We had a full day of fun! From 9 am until 9 pm we did Birthday activities! Chuck E Cheese party, food, gifts, cake, ice cream, roller skating… we did it all! She was pooped by the end of the night so I think it was a success! I say bubble baths and feet massages should be in your future! 🙂 Congrats on your first baby!! We already had spring break but we are loving the weather..lots of rain and flowers! Working on our new online store Fizz-n-fun.com and momming the heck out of every day! AWESOME!!! Yep, I’m loving the flowers too and can’t wait to get my garden growing. Congrats on your business! We are planning on a Spring break trip to upper Michigan near Traverse City. That sounds like so much fun. Hope it goes great! Thanks for stopping by!